Story: Katherine was captured by aliens at the turn of the 20th century and used for experiments. 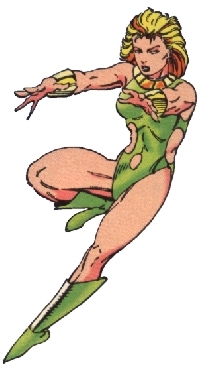 The captors experimented on bio-generated energy manipulation, giving her the ability to weave anti-motion fields effectively neutralizing all surrounding kinetic energy . After the mission on D'vor, where Atlas got killed, Stasis wanted to leave Brigade. On her way out of the headquarter, she was killed by Cabbot Stone . An attempt was made to resurrect her at G.A.T.E. International, but it failed when Shogun blew the resurrection tank apart . Skills & abilities: Stasis can manipulate ambient kinetic energy, freezing an objects movements in a stasis field .